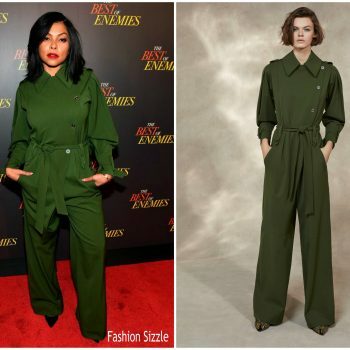 Taraji P. Henson attended ‘The Best Of Enemies’ Photocall in New York City at the Whitby Hotel on Sunday (March 17). 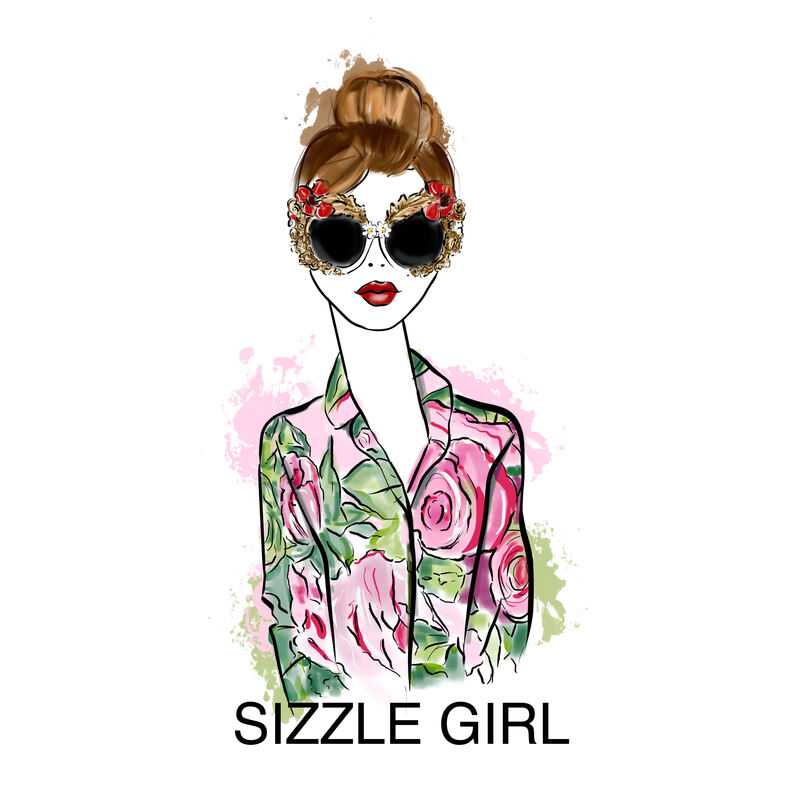 She wore a Jenny Packham Spring 2019 dress. 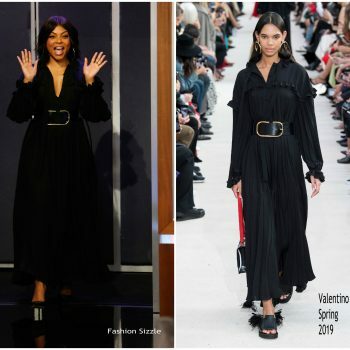 Taraji P. Henson wore a custom neon pink Michael Kors Collection bouclé-crepe one-shoulder ruffle gown to the 2019 Independent Spirit Awards. 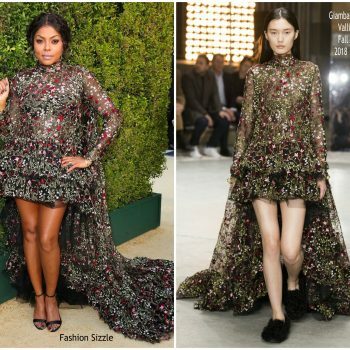 ‘Actress Taraji P.Henson was in attendance to receive her award and star on the Hollywood Walk of Fame on Monday (January 28) in LA. . She wore a Akris Spring 2019 design. 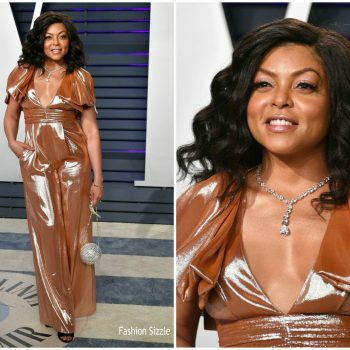 Taraji P. Henson attended the 2029 Golden Globe Awars on Sunday (January 6) in Beverly Hills, California. She wore a custom velvet Vera Wang gown. 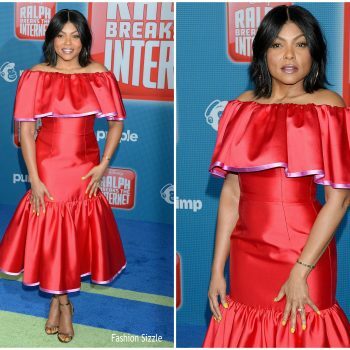 Taraji P. Henson, attended the world premiere of her new movie Ralph Breaks the Internet held at El Capitan Theatre on Monday (November 5) in Los Angeles. She wore a red Carolina Herrera dress. 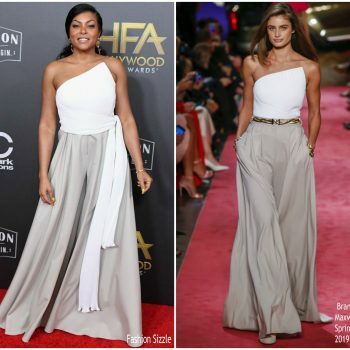 Taraji P. Henson attended the 2018 Hollywood Film Awards at the Beverly Hilton Hotel on Sunday (November 4) in Beverly Hills, Calif. She wore a Brandon Maxwell Spring 2019 gown. 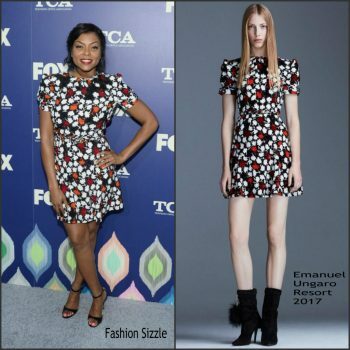 Taraji P. Henson was in attendance at the 2018 Emmy Awards on Monday (September 17) in LA. She wore a Giambattista Valli Fall 2018 embroidered tulle gown. 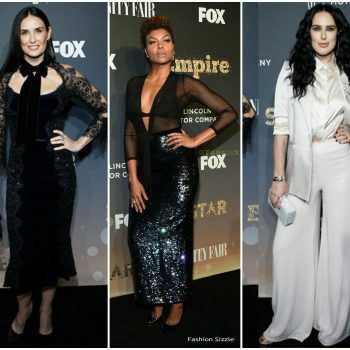 Taraji P. Henson attended the 2018 Fox Network Upfront on Monday (May 14) in New York City. She wore a Altuzarra Fall 2018 styled with Christian Louboutin ‘Galeria’ heels. 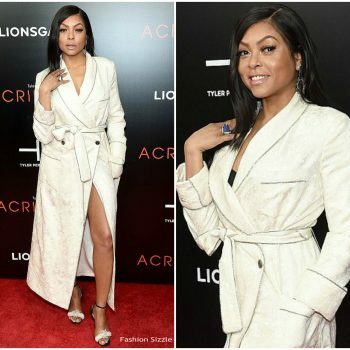 Director Tyler Perry and Taraji P. Henson attended the "Acrimony" New York Premiere on March 27, 2018 in New York City. She wore a Roberto Cavalli bathrobe styled with Louboutin heels and Kimberly McDonald Fine Jewels. 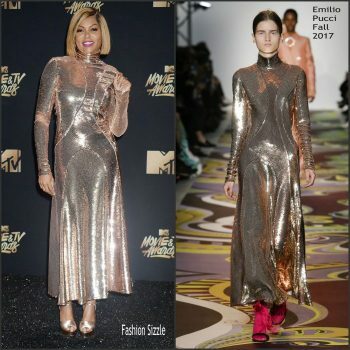 Taraji P. Henson was in attendance at the 2018 amfAR Gala New York on Wednesday (February 7). 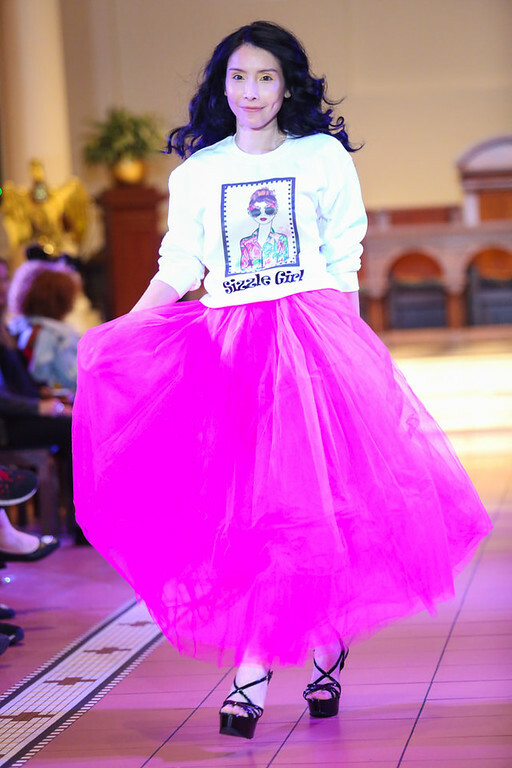 She is wearing a David Koma Spring 2018 gown. 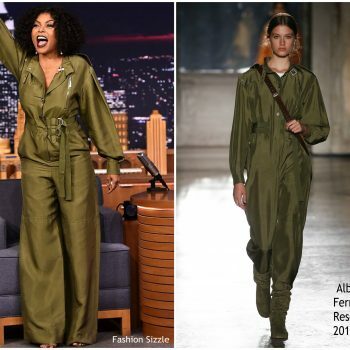 Taraji P. Henson made a guest appearance on ‘The Tonight Show Starring Jimmy Fallon’ on Monday (January 8) for her promo tour for ‘Proud Mary’ . 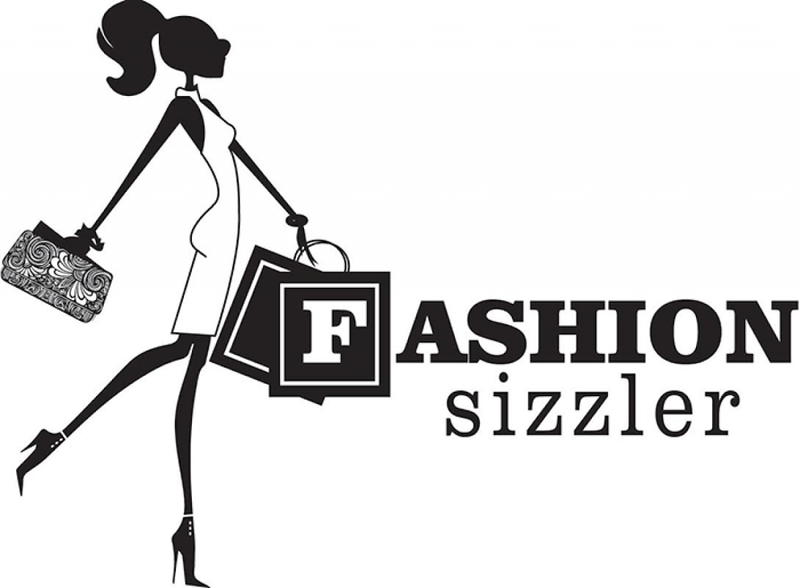 She wore a Preen By Thornton Bregazzi’s black dress. 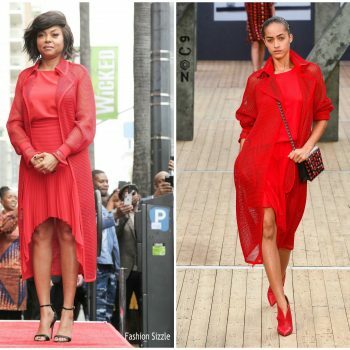 Taraji P. Henson was in attendance at the Billboard Women In Music event on Thursday (November 30) in Hollywood, California. 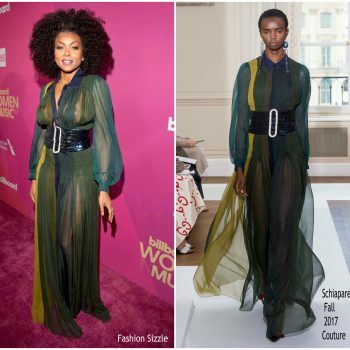 She wore a Schiaparelli Fall 2017 Couture gown styled with an midnight blue embroidered belt. 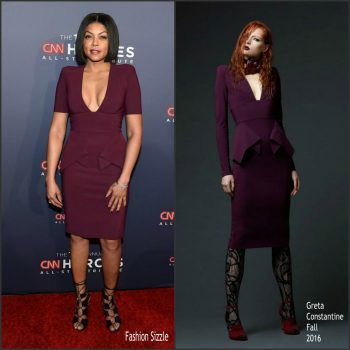 ‘Empire’ star Taraji P. Henson hosted this year’s Black Girls Rock! 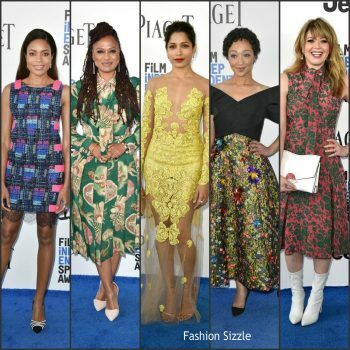 2017 awards show held at NJPAC on Saturday (August 4) in Newark, New Jersey. 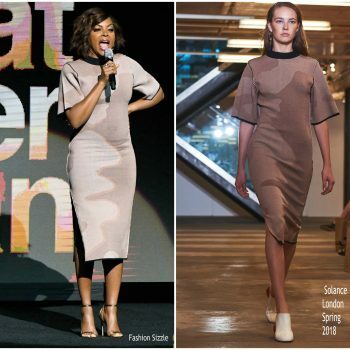 She wore a David Koma Fall 2017 dress. 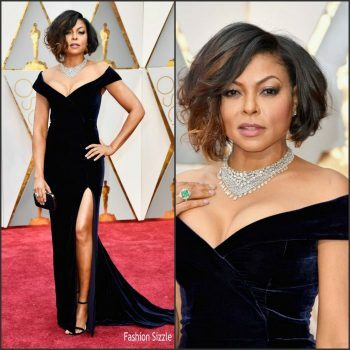 Taraji P. Henson attended the 2017 Academy Awards held at the Dolby Theatre on Sunday (February 26) in Hollywood. She wore a custom navy velvet Alberta Ferretti gown that has a thigh slit. Taraji P. Henson attended the 48th NAACP Image Awards at Pasadena Civic Auditorium on February 11, 2017 in Pasadena, California. 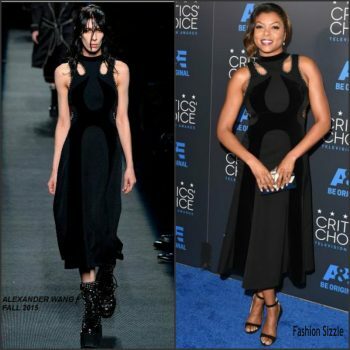 She wore a sleeveless black Alexander Wang NY gown that has a thigh slit. 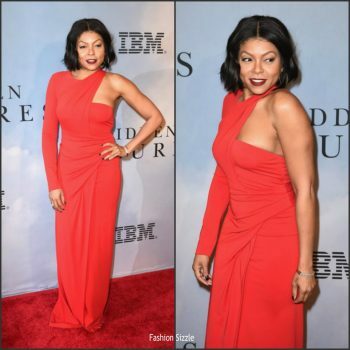 Taraji P. Henson was in attendance at the the 2017 Screen Actors Guild Awards on Sunday, January 29, 2017, in Beverly Hills, CA. She wore an embellished Reem Acra Spring 2017 gown. 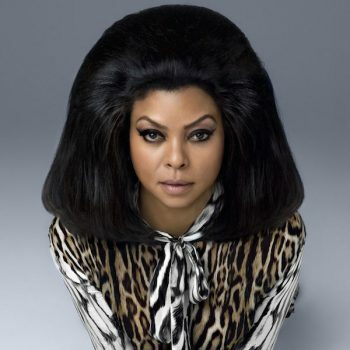 Taraji P. Henson made a guest appearance on Jimmy Kimmel Live to promote Hidden Figgures. 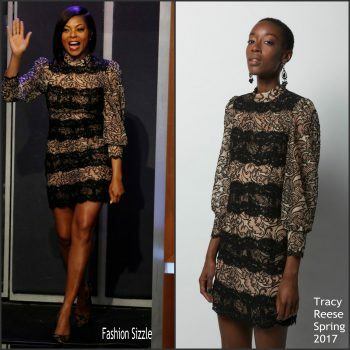 She wore a Tracy Reese Spring 2017 lace embroidered dress. Taraji P. Henson attended the "Hidden Figures" New York Special Screening on December 10, 2016 in New York City. She wore a red Alexander Wang gown. 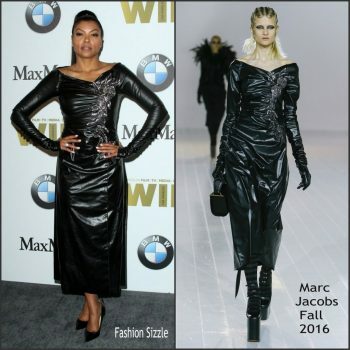 Taraji P. Henson was in attendance at The 44th Annual American Music Awards was held on November 20, 2016, at the Microsoft Theater in Los Angeles. 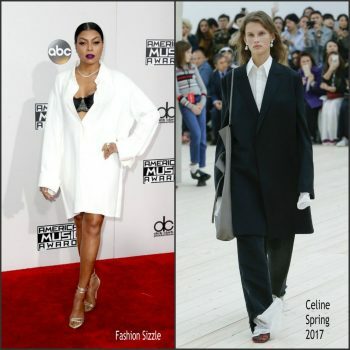 She wore a Céline Spring 2017 oversized white shirt dress. 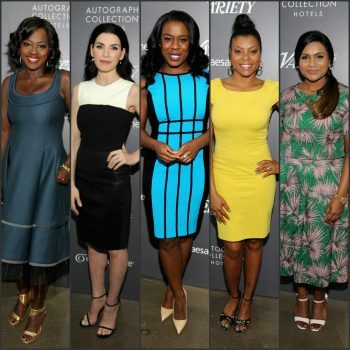 Taraji P. Henson was in attendance at the 2016 Fox Summer TCA Tour party at Soho house yesterday evening August 8 , 2016 in LA. 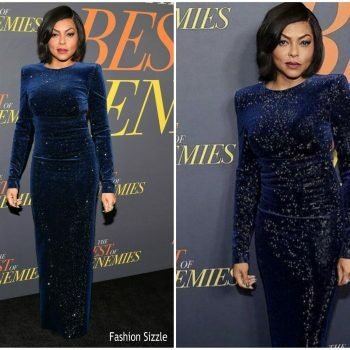 Taraji P. Henson was in attendance and won the best actress Award at the 2016 BET Awards at Microsoft Theater on June 26, 2016 in Los Angeles, California. Taraji P. Henson attends Women In Film 2016 Crystal + Lucy Awards Presented by Max Mara and BMW at The Beverly Hilton on June 15, 2016 in Beverly Hills, California. 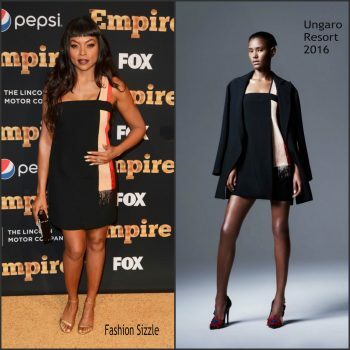 Taraji P. Henson attended the 2016 Fox Network Upfront in support of her hit show Empire held at The Beacon Theatre on Monday (May 16) in New York City.